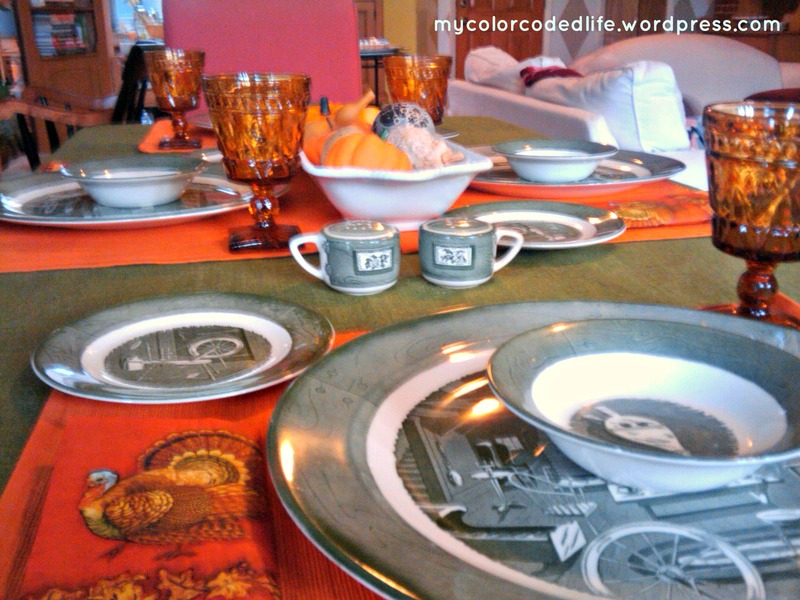 Believe it or not – Thanksgiving is next week! 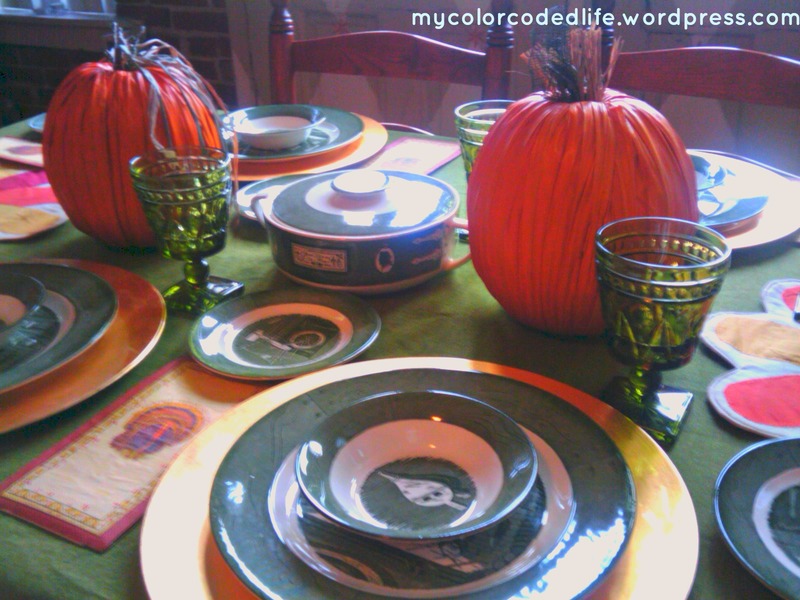 For the first time in awhile – I’m not hosting this year! We are traveling to Atlanta to my sister’s for the holiday. I plan on helping out there though! It seems odd to me to not be doing my usual week before prep, so I thought I would I write about what I usually do. When I host Thanksgiving I actually start two whole weekends before! The Friday before – Finalize your menu and make a complete grocery list. This means combining all the ingredients for each recipe. Counting up how many total tablespoons of butter or cups of chicken stock you will need for every dish you are preparing. If you make the same dishes each year – this step is great. It takes awhile – but then you have it year after year. If you decide to not make one dish – it is easy to subtract one recipe from the totals. 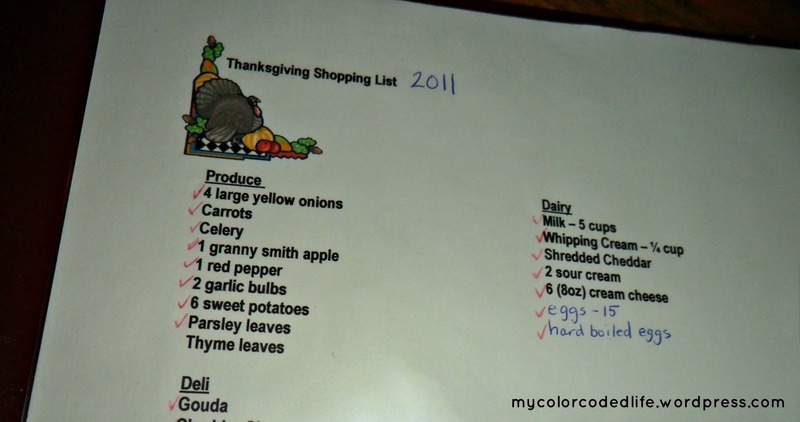 I have a “Thanksgiving Binder” and the first page is the totals of ingredients you need to make everything in the binder. After you make this complete list – it’s time to hit the kitchen! What do you already have and what do you need to buy? From here you will have your grocery list. The Saturday before – Time to go shopping! Every store you need to go to: Grocery, Wine & Spirits, Party City – anything you need – buy it today! This step is exhausting so it’s all you have to do this day. 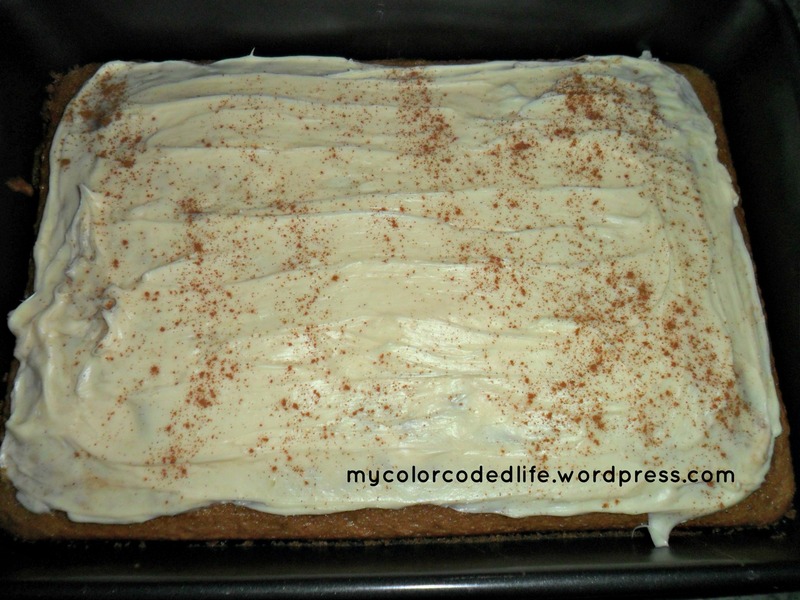 The Monday before – Dessert Day! Before work, I pull out all of the ingredients and what ever equipment (electric mixer) I need to make the desserts. This is a traditional “take-out” night for us since I spend the evening baking all of the desserts and the corn bread. My Color-Coded Life Tip: Make sure to pull ingredients out before work and leave them all on the counter. When you get home for work, you may be tired and not feel like cooking. But if everything is out – it will motivate you. If you come home to a clean counter, it is easier to say – oh, I’ll make it tomorrow! Stick to the schedule — I promise you – you’ll thank me on Thursday! 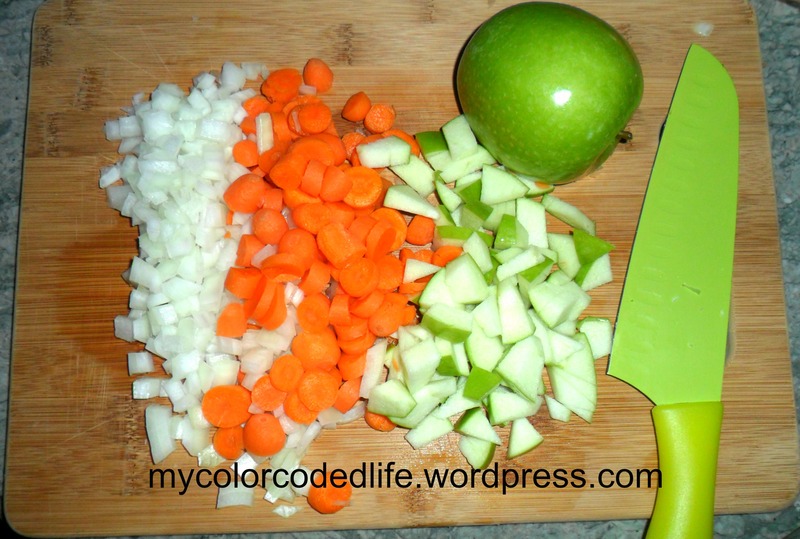 The Tuesday before – Prepare two dishes. To decide which two think of the following things: which recipes are a little more involved, which recipes share ingredients, and what type of space you have in your fridge. I make my squash soup and mac and cheese. 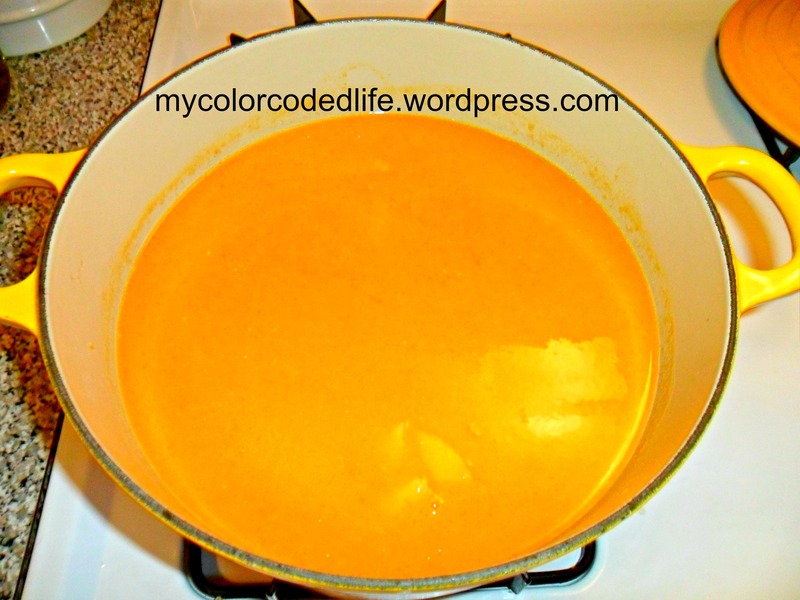 Click to read my recipes here: Squash Soup, Mac and Cheese. I keep the soup right in the soup pot and put it in the fridge. I prepare the mac and cheese and store it in the pan in a fridge so it is ready to pop in the oven. Take the turkey out of the freezer and put it in the fridge to begin defrosting. Wednesday -the day before – I traditionally take this day off from work. Before the kitchen gets all dirty – clean all the dishes and glassware you’ll be using for the holiday and set the table. Do any other household chores/ cleaning you need to do. Survey your fridge and prepare two or three more dishes. I make most of the sides in 13 X 9 rectangular pans which can stack on top of each other in the fridge. I cover each one with tinfoil and put a post-it note on it with what it is, what temperature to cook it, and for how long. If you have extra cutting boards you can put them between pans. Before going to bed Wednesday night – make a schedule of the day counting backwards from when you want to serve dinner. Make an “Oven Schedule.” What dishes are being cooked at the same temperatures, so they can go in the oven at the same time? If you are cooking two dishes at the same time with one on the upper rack and one on the lower, set your timer for half the cooking time. At the midpoint, swap what rack they are on. 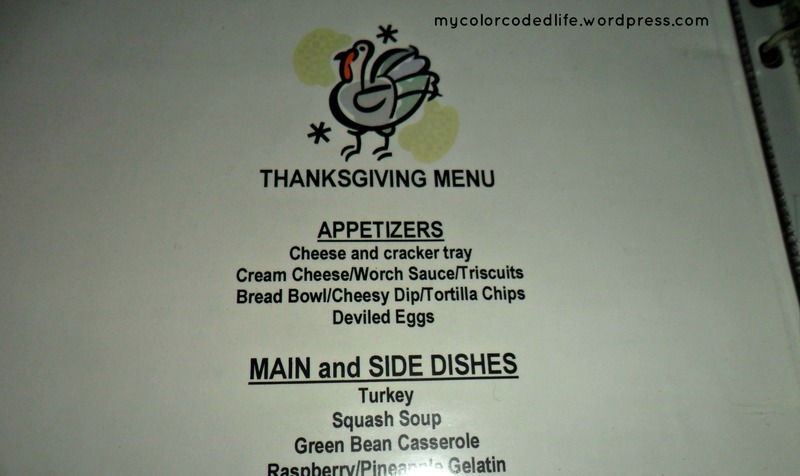 Thanksgiving Day! – Set the alarm early! The bird should go in the oven by 7am! Follow the schedule and you should be fine. I make mashed potatoes, stuffing and baked corn pudding the day of. Allow yourself time to set up cocktails and have one before guests arrive! Enjoy your day! You worked hard for a week to prepare this so enjoy your time with family and friends! Questions? Want specifics on my recipes? Hosting for the first time? Leave me a comment below – and have a Happy Turkey Day! Hosting our first Thanksgiving was a success! Thanks for all of your tips – so helpful! 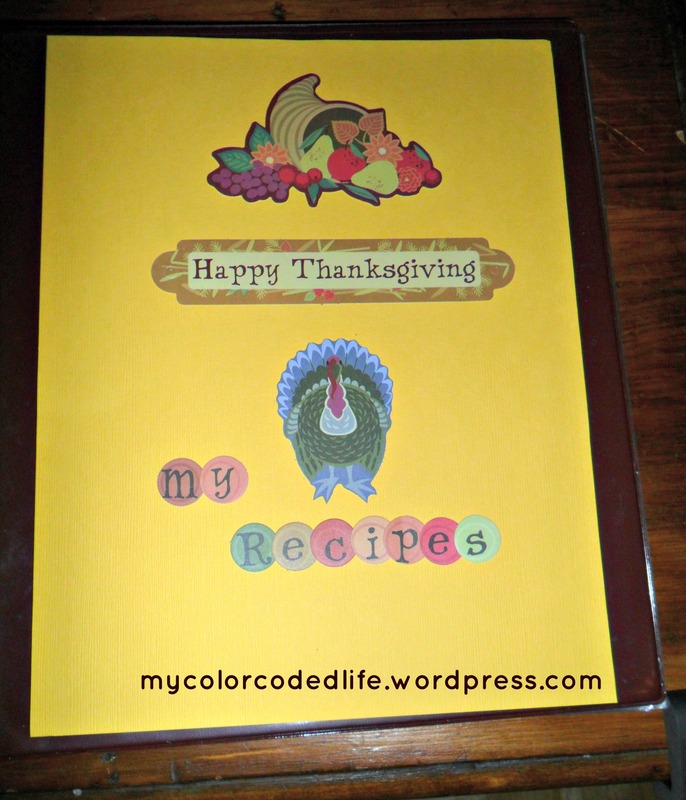 We created our own Thanksgiving binder with the recipes we used. It will be useful to make notes on the recipes from what we learned this year (less orange zest in the cranberry sauce!) and use it next year. That’s great Angela! Glad it all went well. Of course I would love to see your binder!